Saudi Arabia admitted the Riyadh critic was killed at its consulate in Istanbul. Earlier, Riyadh had denied any knowledge of Khashoggi's fate, saying he left the building alive, a claim Turkey refuted from the outset. *) Leading US senators said they were more certain than ever that Saudi Crown Prince Mohammed bin Salman was responsible for the killing of journalist Jamal Khashoggi after receiving a CIA briefing on the matter. Senator Lindsey Graham said, "MBS is complicit in the murder of Khashoggi ... there is not a smoking gun, there is a smoking saw." Republican Senator Richard Shelby said CIA director's briefing on Jamal Khashoggi's homicide confirmed "a lot of our thoughts about the reprehensible killing, something no one in the US would approve of." Democratic Senator Bob Menendez said the US must send clear and unequivocal message to Saudis and sanctions beyond what currently exist against Riyadh would send that message. *) A CIA report alleged that Saudi Crown Prince Mohammed bin Salman may have ordered the killing of journalist Jamal Khashoggi in messages he sent to the leader of an alleged killing squad, the Wall Street Journal reported. "Saudi Crown Prince Mohammed bin Salman sent at least 11 messages to his closest adviser, who oversaw the team that killed journalist Jamal Khashoggi, in the hours before and after the journalist’s death in October," it said, citing a classified CIA assessment. The crown prince told his close circle last August that if they failed to bring back Khashoggi "we could lure him outside Saudi Arabia and make arrangements." *) Turkish President Recep Tayyip Erdogan demanded that Riyadh extradite the suspects in the Jamal Khahoggi killing case so they can face justice in Turkey. The killing of Saudi journalist Jamal Khashoggi is not an issue of Turkey but the whole world, Erdogan said on the sidelines of the G20 summit in Buenos Aires. He said Turkey never saw the killing of the journalist as a political issue, adding that the incident is and will remain as "flagrant murder." The Turkish leader stated that Ankara mobilised all efforts since the brutal killing of the Washington Post columnist inside the Saudi Consulate in Istanbul on October 2. *) Canada announced targeted sanctions on Thursday against 17 Saudi nationals it said were linked to the murder of journalist Jamal Khashoggi in Istanbul last month. The sanctions, which freezes their assets and bars their travel to Canada, "target individuals who are, in the opinion of the government of Canada, responsible for or complicit in the extrajudicial killing of journalist Jamal Khashoggi on October 2, 2018," Foreign Affairs Minister Chrystia Freeland said in a statement. *) Defying President Donald Trump, senators sent a strong signal on Wednesday that they want to punish Saudi Arabia for its role in the murder of journalist Jamal Khashoggi. By a bipartisan 63-37 vote, the Senate opted to move forward with legislation calling for an end to US involvement in the Saudi-led war in Yemen. *) The Argentinian federal judge reviewing a Human Rights Watch complaint against the Saudi crown prince has asked the Argentine foreign ministry to seek information from Yemen, Turkey and the International Criminal Court, the judge's office told Reuters on Wednesday. The office of federal judge Ariel Lijo said it was seeking information on any open cases relating to the murder of Saudi journalist Jamal Khashoggi or war crimes in Yemen. *) US Secretary of State Mike Pompeo said there is no direct reporting connecting Saudi crown prince to Khashoggi murder. *) US Defense Secretary Jim Mattis said Saudi Arabia is fundamental to maintaining regional and Israeli security, during a US senate briefing on Saudi Arabia. He said US interests can't be dismissed even as US seeks accountability for Khashoggi's murder. *) Russian President Vladimir Putin will discuss the killing of journalist Jamal Khashoggi with Saudi Crown Prince Mohammed bin Salman at the G20 summit, a Kremlin aide said. Yuri Ushakov, Putin's foreign policy advisor, told a briefing in Moscow that the two men planned to meet in Argentina. "Of course, they will talk about this subject," he said, referring to the journalist's murder. *) Ahead of the G20 summit in Buenos Aires, Human Rights Watch has filed a submission to an Argentine federal prosecutor concerning the role Saudi Crown Prince Mohammed Bin Salman has allegedly played in the killing of Jamal Khashoggi, and in possible war crimes committed by the Saudi-led coalition in the Yemen conflict. *) Istanbul Chief Prosecutor's Office says that the raid on a villa in Turkey's northwestern province of Yalova was based on information pointing that one of the Khashoggi murderers contacted a Saudi business person residing there. The prosecutor's office named the squad member as Mansour Othman M Abahussain and the Saudi national residing at the Yalova mansion as Mohammed Ahmed A Alfaozan. *) A Turkish prosecutor on Monday said the meeting between one of the suspects in Saudi journalist Jamal Khashoggi's killing and a Saudi resident in Turkey's Yalova province was believed to be linked to the disappearance of Khashoggi's body. The prosecutor said Mansoor Othman Abahusain, one of 15 Saudi suspects who entered Turkey on October 2, when Khashoggi was killed, called Saudi citizen Mohammed Ahmed Alfaozan on October 1 regarding disposal of the writer's body. *) Turkish police are carrying out inspections at a villa in the northwestern province of Yalova in relation to the investigation into Khashoggi's killing. *) A prominent Saudi royal said Saturday that whether or not heads of state gathered in Argentina next week for the Group of 20 summit warmly engage with Crown Prince Mohammed bin Salman, he remains someone "that they have to deal with." Prince Turki al Faisal told The Associated Press the killing of Saudi writer Jamal Khashoggi in the kingdom's consulate in Istanbul last month was an unacceptable incident. "The fact that that the marring has taken place on the kingdom's reputation and other such issues we will have to bear that. It's not something that should not be faced," he said, speaking in Abu Dhabi. *) Israel would be in big trouble without Saudi Arabia, US President Donald Trump said on Thursday, as he hailed Riyadh's role in Middle East, during a brief press conference. "If you look at Israel, Israel would be in big trouble without Saudi Arabia. So what does that mean? (Is) Israel going to leave? Do you want Israel to leave? We have a very strong ally in Saudi Arabia," Trump told reporters at his Florida estate when asked about journalist Jamal Khashogg's killing and if he is holding Saudi highest levels accountable. "Maybe the whole world should be held accountable because the world is a dirty place," Trump said on the killing of Khashoggi. "I hate this incident, I hate the way it's been tried to be covered. I would say that the crown prince hates this situation more than I do." *) Qatar foreign minister says those responsible for Khashoggi's killing need to be held accountable. *) France said on Thursday it had imposed sanctions, including travel bans, on 18 Saudi citizens linked to the murder of Saudi journalist Jamal Khashoggi and warned that more could follow depending on results of the current investigation. *) The EU's top diplomat Federica Mogherini said on Thursday all those "really responsible" for the murder of journalist Jamal Khashoggi have to be held accountable. *) The CIA has a recording of a phone call in which Saudi Crown Prince Mohammed bin Salman gave instructions to "silence Jamal Khashoggi as soon as possible", Turkish news website Hurriyet Daily News said on Thursday. *) Denmark has decided to suspend approvals of weapon and military equipment exports to Saudi Arabia over the killing of journalist Jamal Khashoggi and the situation in Yemen, its foreign minister said on Wednesday. *) Journalist Jamal Khashoggi was barred from media appearances after criticising US President Donald Trump in late 2016, according to the State Department. In its most recent report on Saudi Arabia’s human rights record, the department said Khashoggi moved to the US in "self-exile" in September 2017 and "could face arrest upon returning home" due to his writings. The report said Khashoggi's column in Saudi newspaper al-Hayat had been cancelled under political pressure. *) Calls for Saudi Crown Prince Mohammed bin Salman to be held accountable for the murder of journalist Jamal Khashoggi are a "red line", Saudi Foreign Minister Adel al Jubeir said in a BBC television interview. Jubeir said, "In Saudi Arabia our leadership is a red line. The custodian of the two holy mosques (King Salman) and the crown prince are a red line. They represent every Saudi citizen and every Saudi citizen represents them. And we will not tolerate any discussion of anything that is disparaging towards our monarch or our crown prince." *) US Defense Secretary James Mattis said presidents do not often get freedom to work with "unblemished partners", on killing of Saudi journalist Jamal Khashoggi. He also said he doesn't think either CIA or Saudi government has fully established who is responsible for Khashoggi's killing. *) US President Trump "comes across as kind of a patsy", the Washington Post editor, Fred Hiatt, said on Wednesday, while denouncing Trump's stance on Saudi Arabia after Jamal Khashoggi's killing. *) Republican Senator Rand Paul said it's a "mistake" for President Donald Trump to continue supporting arms sales to Riyadh after the death of Saudi columnist Jamal Khashoggi, saying "it's a sign of weakness not to stand up to Saudi Arabia." Another Republican Senator Bob Corker slammed Donald Trump's statement of support for Saudi Arabia, saying the White House is effectively conducting public relations for Saudi crown prince Mohammed bin Salman. *) Addressing a press conference after meeting his US counterpart in Washington DC, Turkish Foreign Minister Mevlut Cavusoglu said cooperation with Saudi Arabia over Jamal Khashoggi's killing "is not where we want it and Ankara could seek a UN investigation in case Saudi Arabia failed to cooperate." He said Khashoggi case is not about bilateral Turkish-Saudi ties, politics or trade, rather it is about humanity and shedding light on a murder. *) US Democratic Senator Dianne Feinstein said she would withhold support for Saudi Arabia and urged US sanctions after President Donald Trump's statement earlier on Tuesday pledging to back Riyadh despite the murder of journalist Jamal Khashoggi. She said she was "shocked" that Trump would not punish Saudi Crown Prince Mohammed bin Salman for the "premeditated murder". *) US Secretary of State Mike Pompeo defended Trump in a news conference on Tuesday. Pompeo, who spoke following a meeting with Turkey's Foreign Minister Mevlut Cavusoglu in Washington, said the US was obligated to adopt policies that furthered US national security interests. Cavusoglu and Pompeo discussed Khashoggi killing, bilateral, regional issues during the meeting. *) US President Donald Trump said Tuesday the brutal murder of dissident journalist Jamal Khashoggi by Saudi operatives will not derail the US-Saudi relationship –– even if Crown Prince Mohammed bin Salman were found to bear responsibility. "It could very well be that the Crown Prince had knowledge of this tragic event –– maybe he did and maybe he didn't!" Trump said in a statement. "We may never know all of the facts surrounding the murder of Mr Jamal Khashoggi. In any case, our relationship is with the Kingdom of Saudi Arabia," he said. "The United States intends to remain a steadfast partner of Saudi Arabia." *) UK is exploring with EU ways to place sanctions on Saudi Arabia over Khashoggi murder, Anadolu Agency said, citing British foreign office. "The actions Britain and our allies take will depend on two things: firstly the credibility of the final explanation given by Saudi Arabia, and secondly on our confidence that such an appalling episode cannot –– and will not –– be repeated," a foreign office spokesperson added in a statement. *) A US State Department official said on Tuesday that it is "blindingly obvious" that Saudi Crown Prince Mohammed bin Salman ordered the killing of journalist Jamal Khashoggi, according to ABC News. "The idea that it goes all the way to the top is blindingly obvious," the official –– who spoke on condition of anonymity –– was quoted by ABC News as saying. *) Turkish Foreign Minister Mevlut Cavusoglu held a closed door meeting with UN Secretary General Antonio Guterres to discuss the murder of journalist Jamal Khashoggi. Mevlut Cavusoglu spoke briefly to UN reporters after meeting Guterres on the sideline of the Alliance of Civilizations forum held at the UN headquarters in New York. Asked whether Turkey had requested an international investigation, Cavusoglu replied, "We discussed all the aspects of this." *) US Senate intelligence committee member Ron Wyden called on US spy chiefs to "come out and provide the American people and the Congress with a public assessment of who ordered the killing" of Jamal Khashoggi. *) France will decide very soon to impose sanctions on individuals linked to the murder of Saudi journalist Jamal Khashoggi, Foreign Minister Jean-Yves Le Drian said on Monday. "We are working very closely with Germany at this moment ...and we will decide ourselves a certain number of sanctions very quickly over what we know (about the killing)." *) Democratic US Senator Ron Wyden on Monday called on US intelligence officials to publicly release a summary of their findings on the killing of Saudi Arabian journalist Jamal Khashoggi, Wyden said in a statement. *) Saudi Arabia's King Salman bin Abdulaziz says he is proud of kingdom's judiciary and public prosecution, but skips addressing murder of Riyadh critic Jamal Khashoggi, in annual Shura address. *) Germany's foreign minister says Berlin has banned 18 Saudi nationals from entering Europe's border-free Schengen zone because they are believed to be connected to the killing of Saudi journalist Jamal Khashoggi. *) US President Donald Trump said in an interview that aired on Sunday that the murder of Saudi journalist Jamal Khashoggi was "very vicious" but that he wants to stick with Saudi Arabia as a close ally in the Middle East. Trump also questioned the alleged role of Saudi Crown Prince Mohammed bin Salman. "He told me that he had nothing to do with it," Trump said in an interview with "Fox News Sunday", adding that "many people" also said the crown prince had no knowledge of the killing. *) US Republican Senator Lindsey Graham said Saudi Crown Prince Mohammed bin Salman has been a "wrecking ball" in the relationship between Washington and Riyadh. *) Jamal Khashoggi's killers may have taken his dismembered body out of Turkey in luggage, Turkish Defence Minister Hulusi Akar was quoted as saying by broadcaster CNN Turk on Sunday. Speaking at a panel as part of an international conference in Halifax, Canada, Akar was quoted saying, "One probability is that they (the murderers) left the country three to four hours after committing the murder. They may have taken out Khashoggi's dismembered corpse inside luggage without facing problems due to their diplomatic immunity." *) President Donald Trump says there will be a "very full report" on the Khashoggi killing released in the next few days, likely Tuesday. That will include "who did it." *) The Trump administration is taking issue with reports that cite US officials as saying the CIA concluded that Saudi Crown Prince Mohammed bin Salman ordered the killing of the journalist. The state department says reports that the government "has made a final conclusion are inaccurate." Spokeswoman Heather Nauert says "there remain numerous unanswered questions," and the department "will continue to seek all relevant facts." *) Vice-president Mike Pence vowed Saturday the US would hold the murderers of Jamal Khashoggi to account, following media reports that the CIA had concluded the Saudi Crown Prince was behind the Saudi journalist's killing. "The United States is determined to hold all of those accountable who are responsible for that murder," Pence said on the sidelines of an APEC summit in Papua New Guinea. *) The CIA has concluded that Saudi Crown Prince Mohammed bin Salman ordered the assassination of journalist Jamal Khashoggi in Istanbul, the Washington Post reported, a finding that contradicts Saudi government assertions that he was not involved. Saudi Ambassador to US Khalid bin Salman, whose phone call to Khashoggi is cited by the Post as one of the leads investigated by the CIA, tweeted in response to the article that he never spoke to the journalist over the phone or suggested he go to Turkey. He also shared a screenshot of what he said was the complete Saudi response to the Post. *) Turkish President Recep Tayyip Erdogan and US President Donald Trump agreed in a phone call on Friday that all aspects of the killing of Saudi journalist Jamal Khashoggi should be uncovered, the Turkish presidency said. The two leaders also discussed bilateral ties, ongoing legal cases in the United States and developments in Syria, the presidency said, adding that they had discussed the rapid completion of a roadmap in Syria's Manbij. Erdogan also conveyed to Trump Turkey's expectation that the United States would end its support for the Syrian Kurdish YPG militia, the presidency said, an issue that has long infuriated Ankara and strained ties between the NATO allies. *) Hundreds of people in Istanbul joined the funeral prayer for Khashoggi, after hopes to recover his remains faded following reports the body was chemically dissolved by the Saudi agents. *) Turkish newspaper columnist Abdulkadir Selvi, says Turkey has a second, longer audio recording from the Saudi journalist's last day, which contradicts key findings of the Saudi public prosecutor’s indictment published on Thursday against the suspected murderers. The Hurriyet columnist on Friday wrote that the second recording involves the 15 minutes before Khashoggi arrived at the Saudi consulate in Istanbul on October 2, the day he was killed. *) Saudi Arabia's public prosecutor is seeking the death penalty for five suspects charged in Khashoggi's killing, as the kingdom tries to contain its biggest political crisis for a generation. *) Deputy public prosecutor and spokesman Shalaan al Shalaan said that de facto ruler Crown Prince Mohammed knew nothing of the operation, in which Khashoggi's body was dismembered, removed from the building and handed over to an unidentified "local cooperator". *) Khashoggi's family said it is planning a weekend prayer service without his body. *) An international investigation into the killing of Khashoggi is essential, Turkey’s foreign minister said on Wednesday, and reiterated Turkish decisiveness to solve the case. *) Saudi intelligence personnel were "really shocked" upon listening to the tapes related to journalist Jamal Khashoggi's murder, collected by Turkish intelligence and shared with several key foreign countries, Erdogan told media while flying back to Turkey from France. "Saudi intelligence was really shocked by what they heard," Erdogan, who was in France to attend the Armistice Day commemorations, said. *) Shortly after Khashoggi's murder, a member of the kill team instructed a superior over the phone to "tell your boss," believed to be Crown Prince Mohammed, that the operatives had carried out their mission, the New York Times reported on Tuesday. The Times, quoting three people familiar with a recording of Khashoggi's killing, said, "the recording, shared last month with the CIA director, Gina Haspel, is seen by intelligence officials as some of the strongest evidence linking Prince Mohammed to the killing of Mr. Khashoggi." “Let us not forget that this case would have been already covered up had it not been for Turkey’s determined efforts,” communications director at the Turkish presidency Fahrettin Altun told AFP. *) Germany confirmed it has received recordings on killing of journalist Khashoggi. *) Canada’s Prime Minister Justin Trudeau said Canadian intelligence has listened to Turkish recordings of what happened to Khashoggi. *) Turkish authorities are ending the search for the journalist's body believed to have been dissolved in acid, Al Jazeera reported on Saturday, quoting Turkish sources. On Saturday, Turkish newspaper Sabah reported the killers of Khashoggi poured his remains down the drain after dissolving him in acid. Samples taken from the drains at the Saudi consulate in Istanbul showed traces of acid, it said, without quoting sources. Turkey has shared recordings linked to the October 2 murder of journalist Jamal Khashoggi with Riyadh, Washington and other capitals, President Recep Tayyip Erdogan said on Saturday. *) The European Commission said on Friday it is discussing a joint stance for Saudi Arabia following the killing of Khashoggi. "In any case, the member states are in contact with one another," commission spokeswoman Maja Kocijancic said, in a daily press briefing in Brussels. She added that the joint stance would be taken once the results of the investigation into Khashoggi's murder are revealed. *) Turkish investigators probing the murder of Jamal Khashoggi have found traces of "hydrofluoric acid and other chemicals" inside a well at the Saudi consul general's home in Istanbul, Al Jazeera reported on Thursday. Quoting a source in the Turkish attorney general's office, Al Jazeera said "the killers dissolved the journalist's dismembered body in acid in one of the rooms at Consul General Mohammed al Otaibi's residence." *) Pressure on the Saudi government must continue to be applied to find out what happened to journalist Jamal Khashoggi, according to an Egyptian journalist and human rights activist. "Actually after more than 40 days it looks like that the international community has forgotten about Jamal Khashoggi's murder," Osama Gaweesh told Anadolu Agency on Thursday. *) Software made by an Israeli cyber security firm was used to track murdered journalist Jamal Khashoggi, a former US National Security Agency contractor and whistleblower Edward Snowden claimed, Anadolu Agency reported on Thursday. Addressing a conference in Tel Aviv, Israel via a video call from Russia on Wednesday, Snowden said Pegasus spyware sold to governments by NSO Group Technologies was used to track opponents. "The Saudis, of course, knew that Khashoggi was going to go to the consulate, as he got an appointment." *) Turkish Foreign Minister Mevlut Cavusoglu speaking to reporters in Japan says: "we have evidence regarding Khashoggi killing we haven’t shared with the public yet." He added that Turkish officials were not able to get answers from Saudi on who ordered the murder. "A 15-man team could not have come to turkey to kill a Saudi citizen without orders", he said. Cavusolgu confirmed that Turkey will keep sharing information "until we know for sure that the Khashoggi investigation is complete." *) Saudi chemicals expert Ahmad Abdulaziz al-Janobi and toxicology expert Khaled Yahya al-Zahrani identified as the team sent to cover up the murder of journalist Jamal Khashoggi before Turkish police searched the Saudi consulate. Earlier, a Turkish official said that Saudi Arabia sent a two-man "clean-up team" to erase evidence the murder, calling it a sign top Saudi officials knew of the crime. The official said the chemist and toxicologist were tasked with erasing evidence before Turkish investigators were given access to the Saudi consulate and consul's residence. The sons of slain Saudi journalist Jamal Khashoggi made an emotional appeal for the return of their father's body and said they wanted to return to Saudi Arabia to bury him. In an interview with CNN, Salah and Abdullah Khashoggi said that without their father's body, their family is unable to grieve and deal with the emotional burden of their father's death. Over 100 writers, journalists, artists and academics have called United Nations to initiate an independent probe into Jamal Khashoggi's murder. Orhan Pamuk, Arundhati Roy, Meryl Streep, and J K Rowling joined number of people in an open letter to the UN Secretary-General Antonio Guterres that calls the top UN official "to immediately authorise an independent, international investigation into Jamal Khashoggi’s disappearance and apparent murder." *) A month after Khashoggi's disappearance and murder, a memorial service was held in Washington D.C., US, to remember him. It was organised by the Justice for Jamal Khashoggi campaign. "Nothing has relieved me of the pain from the atrocity I experienced. The most important reason for this is because his corpse has still not been found," Hatice Cengiz, his fiancee, said in a recorded message at the memorial. *) The order to murder Khashoggi came from the "highest levels" of the Saudi government, Turkish President Recep Tayyip Erdogan said in an op-ed piece published by the Washington Post on Friday. However, he wrote, "I do not believe for a second that King Salman, the custodian of the holy mosques, ordered the hit on Khashoggi." *) Norway summoned the Saudi ambassador over the Khashoggi's murder. "We have raised the murder of Jamal Khashoggi and presented our point of view to the Saudi ambassador several times after it was known," Ine Eriksen Soereide said in a statement. *) Israeli Prime Minister Benjamin Netanyahu said what happened in Saudi Arabia's Istanbul consulate (Khashoggi killing) was horrifying and we have to deal properly with this problem, Reuters reported on Friday. *) An Israeli official on Friday called the killing of journalist Jamal Khashoggi in Saudi Arabia's consulate in Istanbul "despicable" but said that co-operating with Riyadh against their common foe Iran was Israel's priority. Energy Minister Yuval Steinitz's remarks appeared to break with Israeli government reticence over last month's killing, which has caused global outrage. *) Israeli Prime Minister Benjamin Netanyahu and Egyptian President Abdel Fattah el Sisi have called on the White House to keep supporting Saudi Crown Prince Mohammed bin Salman, despite the murder of journalist Jamal Khashoggi by a hit squad sent from Riyadh, the Washington Post reported. The report cited US officials who said Netanyahu described the crown prince as a "strategic ally" in the Middle East. The Post said Egypt's president Sidi had conveyed a similar message. *) The Istanbul Prosecutor’s Office has said Saudi journalist Jamal Khashoggi’s body has been disposed of after being dismembered, said on Wednesday. “The body of Khashoggi has been dismembered after being killed in the Saudi Consulate,” the office said in a statement, adding that he had been strangled soon after entering the building. *) Saudi Arabian officials have appeared unwilling to "genuinely cooperate" with Turkey's investigation into the murder of journalist Jamal Khashoggi, a senior Turkish official told AFP on Wednesday. "The Saudi officials seemed primarily interested in finding out what evidence the Turkish authorities had against the perpetrators," the official told the French news agency on condition of anonymity. *) France doesn't rule out any sanction against Saudi Arabia if its authorities are found to have been involved in the killing of Khashoggi, French Foreign Minister Jean-Yves Le Drian said on Wednesday. "So long as those who are responsibile and the circumstances around the killing are not made public, released and evaluated, we will go on demanding the truth," Le Drian told RTL radio. "So far we don't have it." Saudi Arabia is a large buyer of French armaments, luxury products and many other exports. *) A senior member of the Saudi royal family is reported to have returned to Riyadh from London in what The New York Times is calling the "most significant move in the royal family since the killing of the dissident Jamal Khashoggi." 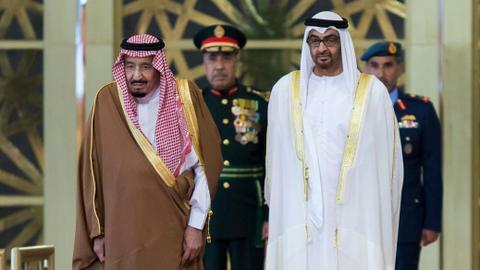 Three Saudis close to Prince Ahmed bin Abdulaziz confirmed his return to the US newspaper. The paper reported that Prince Ahmed, the younger brother of King Salman, had earlier been afraid to return after he appeared to criticise Crown Prince Mohammed bin Salman last month. The 33-year-old bin Salman is the presumed heir apparent to King Salman. Prince Ahmed, in his 70s, is considered one of the most senior figures in the Saudi royal family. It's unclear how his return will play – to bin Salman's detriment or advantage. *) Turkish President Recep Tayyip Erdogan has insisted that the Saudi nationals accused of Jamal Khashoggi’s murder should be put on trial in Turkey. Talking to media in Ankara, Erdogan said that Saudi Arabia should not protect the accused nationals. “We have to solve this issue. There’s no reason to waste time, or to protect anyone involved in the crime,” he added. *) United Nations human rights chief Michelle Bachelet has called for international experts to be involved in an independent investigation into the killing of Saudi journalist Jamal Khashoggi, with access to evidence and witnesses. In a statement, Bachelet also urged Saudi Arabia to reveal the whereabouts of Khashoggi’s body, saying that a forensic examination and autopsy were crucial elements in an investigation into the “shockingly brazen crime”. *) Turkey’s prosecutor asks the visiting Saudi Arabian prosecutor “who sent the team” involved in Khashoggi’s murder. *) Hatice Cengiz, fiancee of slain Saudi journalist Jamal Khashoggi, says she doesn’t know who is ultimately responsible for the murder. Talking to Reuters in London, she said the Saudi royal family has not been in contact with her and no condolences have been offered. She said all those who carried out and ordered his murder should be brought to justice and punished. *) US President Donald Trump’s administration is considering possible actions in response to the killing of Saudi journalist Jamal Khashoggi, White House spokesperson Sarah Sanders said on Monday. “The administration is weighing different options and we’ll make an announcement about what the decision of that action is,” Sanders told a media briefing in response to a question about what actions the administration might take against Saudi Arabia. *) Turkish foreign minister on Monday called on Saudi Arabia to reveal "all truth" regarding journalist Jamal Khashoggi's murder. Those who committed the premeditated murder were arrested in Saudi Arabia and there is an investigation going on in Saudi Arabia as well, Mevlut Cavusoglu said. "Body of Khashoggi couldn't be reached yet... This investigation should be concluded as soon as possible." *) The meeting between the Saudi public prosecutor, who is heading the investigation into the killing of Jamal Khashoggi, and the Istanbul chief prosecutor has ended, state-owned Anadolu news agency said on Monday. *) Top Saudi prosecutor Saud al Mojeb heading Jamal Khashoggi probe arrives at court house to meet Istanbul's chief public prosecutor. *) Saudi Arabia's public prosecutor Saud al Mojeb landed at Istanbul’s Ataturk airport early Monday for talks with the Istanbul prosecutor as part of the investigation into Khashoggi's killing. *) US Defense Secretary Jim Mattis said on Sunday that he had met Saudi Arabia’s foreign minister and called for a transparent investigation into the killing of journalist Jamal Khashoggi. Mattis said he met Saudi Foreign Minister Adel al Jubeir during a conference in Bahrain on Saturday and discussed the killing. *) Speaking after the same summit, Turkey's President Erdogan says Saudi Arabia needs to answer questions regarding Khashoggi's murder; like who sent those 18 people to Turkey? and who was the local collaborator in the murder? *) Erdogan says Khashoggi's murder was committed in Istanbul, therefore, "if Saudi Arabia is not going to do this job, we are ready". The request for the extradition for the 18 people has been relayed to Saudis justice ministry. *) Macron and German Chancellor Angela Merkel on Saturday said they want a "coordinated" European position for sanctions on arms sales to Saudi Arabia after Khashoggi's murder. *) Saudi Arabia's Foreign Minister Adel al Jubeir said on Saturday the suspects detained in Jamal Khashoggi murder case will be prosecuted in Saudi Arabia, adding Saudi law enforcement in Turkey is working with Turkish counterparts on probe. He said the case has become hysteria and investigations take time. *) Pentagon chief Jim Mattis warned Arab leaders on Saturday that the murder of Saudi journalist Jamal Khashoggi inside the kingdom's consulate in Istanbul "must concern us all". The US "does not tolerate this kind of ruthless action to silence Mr. Khashoggi, a journalist, through violence," he told a meeting in the Bahraini capital Manama. *) Turkey's Ministry of Justice confirms that Istanbul’s Public Prosecutor has prepared and submitted extradition requests for 18 suspects who Saudi Arabia arrested for Khashoggi's murder. Riyadh says it arrested 18 people and fired five senior government officials as part of an investigation into the case. The extradition requests was sent to Turkey's Foreign Affairs Ministry who will then deliver it to Saudi Arabia. *) Khashoggi's Fiancee Hatice Cengiz says Khashoggi assumed Saudi authorities would not dare interrogate or arrest him in Turkey, although he was concerned tensions would arise when he visited the consulate in Istanbul. In an interview with Turkish broadcaster Haberturk, she says she also did not accept US President Donald Trump's invitation to visit the White House because she thought it was aimed at influencing public opinion in his favour. Her interview echoed her sentiments seen in her op-eds published in the Washington Post and New York Times. *) Saudi Arabia's chief prosecutor will visit Istanbul on Sunday for talks with Turkish authorities as part of the investigation into the murder of journalist Jamal Khashoggi, Turkey's president said Friday. "They (the Saudis) are sending the chief prosecutor on Sunday to Turkey," President Recep Tayyip Erdogan said, adding that Ankara had more evidence on the killing. Erdogan also asked Riyadh to hand over 18 people arrested over the killing to be tried in Turkey. *) German Economy Minister Peter Altmaier said he welcomed Austria's proposal for a joint European position on arm exports to Saudi Arabia, he told German broadcaster Deutschlandfunk (or DLF) on Friday, as UN expert calls Riyadh critic Jamal Khashoggi's murder an 'extrajudicial' execution. Germany's government has agreed to not deliver weapons to the country at the moment, he said in an interview during a visit to Turkey, adding that the effect of that decision would be stronger if European countries adopted a common position. *) The Saudi journalist was the victim of an "extrajudicial execution" committed by the Saudi state, a UN expert said, calling for an international investigation. Callamard added that "the people involved, the people who commanded it, who orchestrated it are high enough to represent the (Saudi) state." *) Khashoggi's son Salah and his family, have left Saudi Arabia after the government lifted a travel ban. The family are on a plane to the US according to Human Rights Watch. 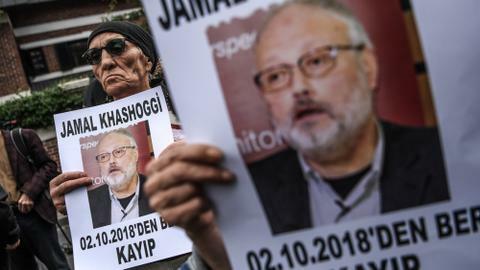 *) Turkish police are investigating water samples taken from a well at the Saudi consul general's residence in Istanbul as part of an investigation into the killing of journalist Jamal Khashoggi. Turkish authorities on Wednesday were granted permission by Saudi officials to carry out inspections of the well after being initially denied access. *) Turkish investigators took statements from 38 Saudi Consulate employees. *) Saudi Arabia's public prosecutor says Khashoggi's murder in Istanbul was "premeditated" based on information supplied by Turkey, state media reported. *) Turkish Foreign Minister Mevlut Cavusoglu says Ankara is taking all necessary steps to clear up the case of slain Saudi journalist Jamal Khashoggi. Addressing a joint press conference with his Palestinian counter part, the Turkish foreign minister further said that everyone connected to the murder needs to be investigated and tried in Turkey. *) CIA Director Gina Haspel, who has been in Turkey, has listened to the audio which is said to have captured the interrogation and killing of the journalist, The Washington Post reported. The audio was "compelling," the Post quoted a person familiar with the recording said. *) France is ready to support "international sanctions" against those responsible for the murder of Saudi journalist Jamal Khashoggi, the Elysee Palace said on Wednesday after President Emmanuel Macron spoke by telephone to the kingdom's King Salman. The French president "informed King Salman of his profound indignation at the crime and demanded that all possible light be shone on the circumstances that led to this drama" which many have blamed on Crown Prince Mohammed bin Salman, the king's son and Saudi Arabia's de-facto leader, the palace said in a statement. *) British Prime Minister Theresa May told Saudi Arabia's King Salman that his country's explanation for the death of journalist Jamal Khashoggi in Turkey lacked credibility, her office said. *) Saudi Arabia's crown prince has called the killing of Jamal Khashoggi a "heinous crime that cannot be justified." 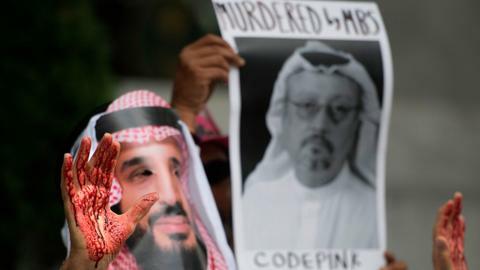 Crown Prince Mohammed bin Salman separately said that the killing of the missing journalist will not "drive a wedge" between the kingdom and Saudi Arabia. His comments on Wednesday came at the Future Investment Initiative in Riyadh. This year's summit, however, has been overshadowed by the disappearance of Khashoggi. *) Turkey's President Tayyip Erdogan spoke to Saudi Arabia' s Crown Prince Mohammed Bin Salman on Wednesday, and the two discussed the steps needed to bring to light all aspects of the killing of journalist Jamal Khashoggi, a presidential source said. *) A vehicle carrying diplomatic number plates and believed to be owned by the Saudi consulate was seen visiting Istanbul's Belgrad Forest, one before journalist Jamal Khashoggi was killed, according to a screengrab of CCTV footage released by Anadolu Agency. *) France will take "punitive measures" if Saudi Arabia is "proven" to be behind the murder of journalist Jamal Khashoggi, government spokesman Benjamin Griveaux said. "In the event that Saudi Arabia's responsibility is proven, we will then draw the consequences and take punitive measures," Griveaux said after a cabinet meeting, while emphasising that Riyadh's role would have to be "corroborated by our intelligence services" first. *) Saudi authorities granted permission to Turkish police to search the well in the garden of Saudi Arabia's consulate in Istanbul as part of the investigations into journalist Jamal Khashoggi's killing, a Reuters report cited NTV. Earlier, Turkey's state-run Anadolu Agency reported that Saudi officials had denied Turkish police to search the well when Turkish investigators had earlier searched the consulate twice, as well as the residence of the Saudi consul general, to gather evidence into Khashoggi's killing. *) President Recep Tayyip Erdogan says some people are uncomfortable with Turkey sharing evidence in the investigation into Jamal Khashoggi's killing. "We are determined not to allow a cover-up of this murder and to make sure all those responsible - from those who ordered it to those who carried it out - will not be allowed to avoid justice," he further said at a speech in Ankara. *) Iranian President Hasan Rouhani said Saudi Arabia would not have killed Jamal Khashoggi without American protection, Reuters cites state-run IRNA. *) US President Donald Trump for the first time acknowledged Saudi Crown Prince Mohammed bin Salman could be involved in the killing of Khashoggi. Earlier, he called the Saudi operation which killed Khashoggi the "worst cover-up in the history of cover-ups" as his administration imposed visa restrictions on 21 Saudis linked with the journalist's death. "There should have never been an execution or a cover-up, because it should have never happened," Trump told reporters. "I would say it was a total fiasco from day one," he added. *) Saudi officials told AP and NBC News a squad had indeed been sent to Turkey to deal with Khashoggi. It included forensics, logistics and a body double whose job was to dress in the journalist’s clothes and pretend to be him. But they maintain his death was an accident. The Saudi officials acknowledged the plan allowed for removing Khashoggi from the consulate and questioning him at a "safe house." They justified the squad's composition by saying had the safe house been used, the forensic expert was needed to wipe evidence that Khashoggi had been at the consulate and for the body double to leave the facility to give the false impression that Khashoggi had left on his own. They acknowledged the kingdom sent a team to Turkey, but said the men were acting on a directive issued by King Salman's predecessor, King Abdullah, to bring Saudi dissidents abroad back to the kingdom — ostensibly to take part in a "national dialogue" over the country's future. *) Foreign ministers from the Group of Seven leading industrialised nations condemned the killing of Khashoggi "in the strongest possible terms" and said Riyadh must make sure such an incident never happens again. In a statement, the G7 ministers said Saudi explanations for Khashoggi's death "leave many questions unanswered." The ministers also repeated their call for a thorough, credible, transparent and prompt investigation. *) Crime scene investigation teams probing Jamal Khashoggi's killing, arrived at the car park in Istanbul's Sultangazi district where a Saudi consulate vehicle was found abandoned. The forensic experts found a computer, some documents and personal belongings during a search of the vehicle and are trying to determine their ownership. *) US Vice President Mike Pence vowed to press Saudi Arabia for answers after Turkish President Recep Tayyip Erdogan said journalist Jamal Khashoggi's killing in the kingdom's Istanbul consulate was meticulously planned. "The world is watching. The American people want answers and we will demand that those answers are forthcoming," Pence told an event at The Washington Post, where the slain journalist and Riyadh critic was a contributing opinion writer. *) Saudi King Salman bin AbdulAziz received Jamal Khashoggi's family members, including the slain journalist's son, Salah bin Jamal Khashoggi, in Riyadh, state news agency SPA reported. The meeting was also attended by Saudi Crown Prince Mohammed bin Salman, SPA said. The Saudi king also said the kingdom will hold to account those who had "failed in their duties" over Jamal Khashoggi's killing, no matter who they are. *) British Prime Minister Theresa May said that the statement by Turkish President Recep Tayyip Erdogan underscores the fact that questions over Khashoggi remain. She added that only the Saudis can provide answers to the questions. Meanwhile, British Foreign Secretary Jeremy Hunt said he is "deeply concerned to hear President Erdogan describe Jamal Khashoggi murder as pre-meditated." *) Turkish President Recep Tayyip Erdogan has said that the murder of Saudi journalist Jamal Khashoggi was 'brutal' and ‘premeditated’. “Murder of Saudi journalist Jamal Khashoggi was premeditated”, Erdogan said in Ankara, adding that Turkey has strong evidence that the murder was planned. He said the 18 Saudis suspected of carrying out the murder should be tried in Turkish courts, adding all those responsible for the killing must be punished regardless of rank — from the person who ordered his death to those who carried out the killing. *) Turkish Foreign Minister Mevlut Cavusoglu says Turkey is ready to cooperate in a possible probe into Saudi journalist Jamal Khashoggi’s case at the UN, international courts or institutions. He says Ankara has not shared any information with any country on Khashoggi’s case yet. The Turkish foreign minister added that Saudi Arabia was more open to cooperation after phone call between Saudi King Salman and President Erdogan. *) Leader of Turkey's Nationalist Movement Party (MHP) Devlet Bahceli says all signs in Khashoggi's murder point to Saudi Crown Prince Mohammad bin Salman. *) Saudi Arabia's stock market dived in early trade, on the opening day of a three-day investment conference, amid persistent investor concern about global reaction to the Khashoggi's killing. The Saudi index fell 1.3 percent at 7,546 points in half an hour, with banks and petrochemical shares the biggest losers. *) CIA Director Gina Haspel is travelling to Turkey to work on the investigation into the death of the journalist at the Saudi consulate in Istanbul, Anadolu Agency and Reuters quoted US media and sources. *) Saudi Crown Prince Mohammed bin Salman met US Treasury Secretary Steven Mnuchin in Riyadh on Monday, Saudi state TV tweeted. Mnuchin said on Sunday Saudi Arabia’s explanation of the killing of Khashoggi was a “good first step but not enough”, adding that it was premature to discuss sanctions against Riyadh over the incident. *) German Chancellor Angela Merkel on Monday called the killing of the journalist in the Saudi consulate in Istanbul a “monstrosity” and vowed to halt all German arms exports to Saudi Arabia until the case is cleared up. Merkel first called for a stop to arms exports on Sunday, raising questions about whether that would also affect weapons deliveries that had previously been approved. Her spokesman told reporters earlier on Monday that was being reviewed. *) Trump said that he is unsatisfied with Saudi Arabia's explanations of what happened to Khashoggi, but he does not want to lose investment from Riyadh. "I am not satisfied with what I have heard," Trump told reporters at the White House, adding that he thought more would be known about the controversial case "very soon." *) Unnamed sources with links to the Saudi royal family told Reuters that Saud al Qahtani, a top aide for Crown Prince Mohammed who was allegedly behind Khashoggi's killing, gave orders to a team of 15 hitmen over Skype. According to one high-ranking Arab source with access to intelligence and links to members of Saudi Arabia’s royal court, Qahtani was beamed into a room of the Saudi consulate via Skype after Khashoggi arrived at the consulate. A Turkish intelligence source relayed that at one point Qahtani told his men to dispose of Khashoggi and then said: "Bring me the head of the dog." *) Turkish President Recep Tayyip Erdogan's spokesman Ibrahim Kalin said Saudi Arabia remains an important "brotherly and friendly country" and that Ankara does not want ties with Riyadh to be harmed. Briefing reporters following a Cabinet meeting, Ibrahim Kalin said Turkey was obligated to investigate any killing that takes place within its borders, referring to Khashoggi's killing at the Saudi Consulate in Istanbul. He said, "The approach of our president from the beginning has been extremely clear: that nothing concerning this incident remains a secret. Rather than making it an issue between the two countries, there has been a determination for the incident to be brought to light." *) British Prime Minister Theresa May calls for the "truth" over Khashoggi's killing. *) TRT World obtains exclusive CCTV footage of a suspect leaving a Saudi consulate vehicle in a parking lot in Istanbul's Sultangazi district. The footage shows a man driving a BMW approach the already-parked Mercedes vehicle that belonged to the Saudi consulate. Later, the unidentified man is seeing transferring a package from the Mercedes into the BMW, that also bore diplomatic number plates, before driving away. *) Spokesman for Turkey's governing AK Party Omer Celik says Jamal Kashoggi's killing was a violently planned and a very complicated murder with a lot of effort put into covering it up. The AK Party spokesman said the results of the investigation into journalist's killing will be revealed and that those found responsible will be punished. He added that no one will ever think about attempting something like this again. *) Police have found an abandoned car in a private parking lot in Istanbul with diplomatic plates that indicate it belongs to the Saudi consulate and match those of the car seen outside the building when Khashoggi disappeared, sources tell TRT World. The vehicle's registration documents obtained by TRT World, show that the vehicle was bought in 2011 with the owner as the Saudi consulate in Istanbul. *) An adviser to Turkish President Recep Tayyip Erdogan dismissed the Saudi assertion that Jamal Khashoggi died in a fight in the kingdom's Istanbul's consulate, one of several accounts of the journalist's disappearance to have emerged from Riyadh. "One cannot help but wonder how there could have been a 'fistfight' between 15 young expert fighters ... and a 60-year-old Khashoggi, alone and defenceless," said Yasin Aktay, an adviser to Erdogan in the AK Party. "It explains no aspect of the incident according to all the information reached - on the contrary, it leads to even more questions," Aktay, who is also a close friend of Khashoggi, wrote in a column in Turkish newspaper Yeni Safak. "The more one thinks about it, the more it feels like our intelligence is being mocked," he wrote. *) CNN releases video of what it says is a Saudi operative disguised as Jamal Khashoggi leaving the back door of the Saudi consulate in Istanbul on October 2, the day of his killing, to try to make it look like the journalist had left the building alive. The video later shows the man, still dressed in Khashoggi's attire, entering a public toilet near the Blue Mosque in Istanbul's Fatih district and then emerging in his own clothing in an attempt to blend into crowd. The man in the video was identified by a Turkish official as Mustafa al Madani, who was part of the hit squad, sent to kill the journalist at the Saudi consulate. *) Saudi Arabia's Foreign Minister Adel al Jubeir says that Khashoggi's "murder" was a "tremendous mistake," that was carried out by individuals acting "out of the scope of their authority." Speaking in an interview on Fox News, Jubeir said the Saudi leadership initially believed Khashoggi had left its consulate in Istanbul, where he was last seen on October 2, and that the kingdom did not know the where his body was. *) Saudi King Salman and Crown Prince Mohammed called slain Saudi journalist Jamal Khashoggi's son, Salah, to express their condolences, the Saudi Press Agency said late on Sunday. *) Turkey's President Erdogan and US President Trump held phone conversation on Sunday and agreed that the slain journalist Khashoggi's case need to be cleared up with all aspects, the Turkish presidency said. *) Istanbul’s governorate ruled a protection order for Hatice Cengiz, fiancee of slain Khashoggi. The Istanbul Governor’s Office ordered protection for Cengiz, said a security source who spoke on condition of anonymity due to restrictions on speaking to the media. Talking to “Fox News Sunday,” he added that Mohammad Bin Salman should be replaced and the US should re-consider its arms sales to the kingdom not just because Khashoggi's killing but also over the war in Yemen. *) Britain, Germany and France issued a joint statement condemning the killing of Khashoggi, saying there is an "urgent need for clarification of exactly what happened." *) Germany will not export arms to Saudi Arabia while the current uncertainty over the fate of journalist Jamal Khashoggi persists, Merkel said. Campaigning for her party in a regional election, Merkel said "First, we condemn this act in the strongest terms. Second, there is an urgent need to clarify what happened - we are far from this having been cleared up and those responsible held to account ... As far as arms exports are concerned, those can't take place in the current circumstances." German Economy Minister Peter Altmaier later also pressed for a joint European Union position on Saudi Arabia. *) Turkey’s President Recep Tayyip Erdogan said he will make a statement on Khashoggi during his party's group meeting at parliament on Tuesday. *) Sources told TRT that Istanbul’s Chief Prosecutor has called 28 more Saudi consulate staff, including Turkish and foreign nationals, to give testimony on Monday over Khashoggi's disappearance. *) US Treasury Secretary Steve Mnuchin confirmed he won't attend an investment conference in Riyadh and said information coming in from Saudi's on Khashoggi incident is a "good first step but obviously not enough." Mnuchin said it is premature to comment on possible US sanctions against Saudi Arabia over Khashoggi incident and added that he has 'no reason to believe' Riyadh will not honour commitments to cover any oil supply shortage that arise as a result of the sanctions on Iran. *) A senior Saudi government official has laid out a new version of Khashoggi's death inside the Saudi consulate in Istanbul that contradicts previous explanations from the kingdom in many key areas, according to a Reuters report. The latest account, provided by a Saudi official who requested anonymity, includes details on how the team of 15 Saudi nationals sent to confront Khashoggi on October 2 had threatened him with being drugged and kidnapped and then killed him in a chokehold when he resisted. A member of the team then dressed in Khashoggi's clothes to make it appear as if he had left the consulate, the report adds. After denying any involvement in Khashoggi's disappearance for two weeks, Saudi Arabia had later said he had died in a fistfight at the consulate. An hour later, another Saudi official attributed the death to a chokehold, which the senior official reiterated. *) Canada condemned Saudi Arabia's account of the death of Jamal Khashoggi as inconsistent and not credible, calling for a "thorough" investigation. "The explanations offered to date lack consistency and credibility," Foreign Minister Chrystia Freeland said in a statement. *) Condemning Khashoggi's killing by Saudi operatives, New Zealand joins a long list of countries and international companies and media sponsors that have pulled out the upcoming "Davos in the Desert" investment summit in Saudi Arabia. New Zealand's Trade Minister David Parker said in the statement no officials will attend the upcoming Future Investment Initiative, being held in the Saudi capital of Riyadh next week. *) US President Trump says he is not satisfied with Saudi Arabia's handling of the death of journalist Jamal Khashoggi in Istanbul, and that many questions remain unanswered. Trump also warned against halting a Saudi arms deal, saying it would hurt American jobs. *) Saudi Arabia deployed an online army to harass Jamal Khashoggi and other critics of the kingdom on Twitter, the New York Times reported on Saturday. The efforts to attack Khashoggi and other influential Saudis, and sway public opinion against them on the social media service, included a so-called troll farm based in Riyadh and a suspected spy within Twitter that the kingdom utilised to monitor user accounts, the New York Times reported. The Times reported Saudi operatives began a social media campaign to harass critics in 2010. Saud al Qahtani, an adviser to the crown prince, created the strategy behind the effort, the newspaper said, citing US and Saudi officials. Qahtani was one of five officials Saudi King Salman has fired, according to Saudi state media, following the global controversy over Khashoggi's disappearance. *) Germany's foreign minister is calling into question the sale of arms to Saudi Arabia. Heiko Maas told German public broadcaster ARD that "as long as these investigations continue, as long as we don't know what happened there, there's no basis for reaching positive decisions on arms exports to Saudi Arabia." *) The EU's top diplomat Federica Mogherini called for a thorough investigation into the "deeply troubling" death of Saudi critic Jamal Khashoggi and full accountability for those responsible. "The European Union, like its partners, insists on the need for continued thorough, credible and transparent investigation, shedding proper clarity on the circumstances of the killing and ensuring full accountability of all those responsible for it," said a statement on Mogherini's behalf. *) France condemns the killing of Khashoggi and wants an in-depth investigation of the case, Foreign Minister Jean-Yves Le Drian said. "The confirmation of Mr Jamal Khashoggi's death is a first step toward the establishment of the truth. However, many questions remain unanswered," Le Drian added. *) Saudi Justice Minister Waleed Al Samaani said the murder of Khashoggi happened on a territory under Saudi sovereignty and it will reach the courts when all requirements have been completed. *) Amnesty International says Saudi Arabia should "immediately produce" Khashoggi's body so that independence forensic experts can conduct an autopsy in line with international standards. *) Yemen praised decisions made by the Saudi king in relation to the death of Khashoggi, according to the Saudi-backed government's state news agency. *) German Chancellor Angela Merkel has expressed dissatisfaction with Saudi Arabia's version of events at a regional convention of her Christian Democratic Union party in eastern Germany. “They still haven’t been cleared up and of course we demand that they be cleared up,” she said. *) Dutch Prime Minister Mark Rutte said that further investigations are needed. "A lot still remains uncertain. What happened? How did he die? Who is responsible? I expect and I hope that all relevant facts will be clear as soon as possible," Rutte told reporters in Copenhagen. *) The Turk-Arab Media Association, of which Khashoggi was a member, said it wanted all those involved in the plot – right up to the highest rung – to be punished. "We demand that not only the 18 men but those who commanded (the killing) are punished," said Turan Kislakci, the head of the association, speaking outside the Saudi consulate in Istanbul. *) Egypt praised what it called the "decisive" and "brave" actions taken by Saudi King Salman, adding that it offered its condolences to Khashoggi's family and said it was confident the investigation would reveal the truth. *) Britain's Foreign Office says it is considering the Saudi report confirming Khashoggi's death, and reiterated that those responsible must be held to account. *) Turkey will "never allow a cover-up" of the killing of Khashoggi in Saudi Arabia's consulate in Istanbul, deputy head of Turkey's governing Justice and Development (AK) Party Numan Kurtulmus said. "It's not possible for the Saudi administration to wiggle itself out of this crime if it's confirmed," Kurtulmus said. *) Speaking to reporters on his way back from a visit to Moldova, Turkish President Recep Tayyip Erdogan said: "We can't leave this situation like this." He said authorities are working to establish exactly what happened to Khashoggi. *) French daily Le Figaro reports that a council from the Saudi ruling family are discussing the possibility of replacing Crown Prince Mohammad bin Salman. The report cites a diplomatic source in Paris and a Saudi source in Riyadh. *) Saudi Arabia said preliminary results of an investigation indicate journalist Jamal Khashoggi died after a fight broke out between the prominent Riyadh critic and people who met him in the Saudi consulate in Istanbul on October 2. Saudi state TV said investigations are still underway and that 18 Saudi nationals have been arrested so far. *) US 'saddened' by confirmation of Khashoggi death, offers condolences to his family, fiancée, friends - White House, in a statement. The US president said he found the Saudi version of events credible, a position not shared by at least some senior US lawmakers, including usual Trump ally, Senator Lindsey Graham. "First, we were told Mr Khashoggi supposedly left the consulate and there was blanket denial of any Saudi involvement. Now, a fight breaks out and he's killed in the consulate, all without knowledge of Crown Prince [bin Salman]," Graham said. "The Saudis very clearly seem to be buying time and buying cover. But this action raises more questions than it answers and there is no way the world will wait for 30 days for a Saudi investigation to be done," said Democratic US Senator Richard Blumenthal. *) UN Secretary-General Antonio Guterres says he is "deeply troubled" by the confirmation of Khashoggi's death, and stresses the need for an investigation into the circumstances and that those responsible be held fully accountable. *) US President Trump says he will have Congress involved in determining what to do over Khashoggi case, might consider sanctions. "It is too early to say, we are doing investigation‚ we are going to get to the bottom of it... I will have Congress involved." Trump says he might know "a lot by Monday" in Khashoggi case. *) US Secretary of State Mike Pompeo says the US has a "wide range" of responses if Saudi Arabia if found culpable for Khashoggi's death. *) US Federal Reserve officials are monitoring the case of Khashoggi and the possibility that any sanctions against Saudi Arabia could disrupt oil markets, Atlanta Fed President Raphael Bostic said on Friday. *) Employees of the Saudi Arabian consulate in Istanbul are giving testimony at the Turkish prosecutor's office, Anadolu news agency said on Friday, as part of the investigation into the disappearance of journalist Jamal Khashoggi. *) Turkish Foreign Minister Mevlut Cavusoglu denies Ankara gave 'any kind of audio tape' on Khashoggi to the US. He further says that Ankara will share results of investigation on Khashoggi's disappearance with the world. *) Sources tell TRT World that local employees of the Saudi consulate in Istanbul are being called to testify to the prosecutor's office in the Khashoggi case. *) More than 40 lawmakers have urged Trump to impose sanctions under the Global Magnitsky Human Rights Accountability Act on those responsible for Khashoggi's alleged murder. "If your immediate investigation and determination are consistent with ongoing media reports about this outrageous action, we urge strong, comprehensive sanctions," members of the House of Representatives said in a letter. *) Twitter suspended a network of suspected bots that were pushing pro-Saudi Arabia talking points over Khashoggi's disappearance during the past week, according to a news article published on the NBCNews website. Twitter was made aware of some of the bots after NBC News presented it with a list of hundreds of accounts that simultaneously tweeted and retweeted the same pro-Saudi government content. The list was compiled by Josh Russell, an Indiana-based information technology professional who has previously identified foreign influence campaigns online, most of which were from Russia. *) France has suspended some political visits to Saudi Arabia over the case of missing Saudi journalist Jamal Khashoggi, the country's president said. Speaking at a press conference in Brussels, Emmanuel Macron said a planned trip by Finance Minister Bruno Le Maire to the Saudi capital, Riyadh, to attend an economic conference has been cancelled. *) Trump said it "certainly looks" US-based Saudi journalist Jamal Khashoggi is dead. "It certainly looks that way to me," Trump told reporters at Andrews Air Force Base when asked if Khashoggi was dead. Trump did not said what he based his conclusion on. But he said the consequences for the Saudis "will have to be very severe" if they are found to have killed him. *) President Vladimir Putin said that Russia did not have enough information about Khashoggi's unexplained disappearance to justify spoiling ties with Riyadh. Putin told a discussion forum in the Black Sea resort of Sochi that Moscow did not really know what had happened in the case, that it was a pity that the journalist had gone missing, and that Russia would wait for details. *) Saudi rulers are considering to blame a top intelligence official for the killing of Jamal Khashoggi, The New York Times cited three people with knowledge of the Saudi plans. The three people cited by the Times article said that even though the investigation into Khashoggi's disappearance is underway, the Saudis are indicating that General Ahmed al Assiri is the culprit and have already briefed people close to the White House and forwarded the name of Crown Prince Mohammed's close aide. *) US Secretary of State Mike Pompeo said he told Saudi Arabia's rulers that Washington takes "very seriously" the disappearance of journalist Jamal Khashoggi and will await the outcome of investigations by the kingdom and Turkey before deciding how the US will respond. Pompeo addressed reporters after briefing Trump at the White House on his talks with leaders in Saudi Arabia and Turkey and said the Saudis assured him they will conduct a "complete, thorough" investigation into the disappearance. "I told President Trump this morning we ought to give them a few more days to complete that, so that we too have a complete understanding of the facts," Pompeo said. *) Turkish police have conducted a search to find the remains Jamal Khashoggi in Istanbul's Belgrad Forest, sources tell TRT World. The Washington Post also reported that Turkish investigators had expanded their search to two wooded areas in the outskirts of Istanbul including Belgrad forest and a farmland in Yalova province. *) More than two weeks after Khashoggi went missing, The Washington Post has published a new column by the missing Saudi writer titled, "Jamal Khashoggi: What the Arab world needs most is free expression," in which he warns that governments in the Middle East "have been given free rein to continue silencing the media at an increasing rate." A note affixed to the top of the column by the Post Global Opinions editor Karen Attiah said she received the essay from Khashoggi's translator and assistant a day after he was reported missing. In the op-ed Khashoggi recounted the imprisonment of a prominent writer who spoke against the Saudi establishment. *) Four prominent human rights and press freedom groups urged Turkey to request a United Nations investigation to prevent a "whitewash" of the alleged crime. *) US Treasury Secretary Steven Mnuchin announced on Twitter he "will not be participating in the Future Investment Initiative summit in Saudi Arabia," after meeting with Trump and Secretary of State Mike Pompeo. Mnuchin's announcement sent stocks tumbling on Wall Street. Netherlands and France also earlier announced they will not attend the conference in Saudi capital Riyadh next week after Khashoggi's disappearance. Netherlands have also cancelled a scheduled trade mission to the kingdom. British trade minister Liam Fox also decided not to attend an investment summit in Riyadh, a government spokesman said. *) Turkey's Justice Minister Abdulhamit Gul says the case is being 'thoroughly' investigated and results are expected to be released soon. *) Turkey's Sabah newspaper publishes stills from surveillance video showing a member of Prince Mohammed's entourage to the US walking into the Saudi consulate in Istanbul before Khashoggi went missing there. *) The New York Times reports that audio recordings reveal how journalist Jamal Khashoggi was tortured and beheaded after entering the Saudi consulate in Istanbul on October 2. The New York Times quotes senior Turkish officials who allegedly passed on gruesome details from the recordings. Turkish newspaper Yeni Safak has also given details from the recordings saying Khashoggi was dismembered in just a few minutes. *) Turkish crime scene investigators and forensics team left the Saudi consulate in Istanbul early Thursday morning after an overnight search. Turkish investigators searched both the consulate and the consul's residence in Istanbul for a second time. *) The US has requested audio and video evidence concerning Khashoggi's disappearance "if it exists," Trump said on Wednesday. "We have asked for it. If it exists we have asked for it," Trump told reporters in the Oval Office. Trump continued to stand by Saudi Arabia but said he is "not giving cover at all" to Riyadh, whom he repeatedly called a close US ally. *) Turkish police arrived at the residence of the Saudi consul to conduct a search. Eleven Saudi officials also arrived at the residence earlier on Wednesday afternoon. The investigation at the Saudi consul's residence in Istanbul will continue and all consular vehicles use will be inspected, said Turkish Foreign Minister Mevlut Cavusoglu after his meeting with the US Secretary of State Mike Pompeo in Ankara. Cavusoglu said Pompeo communicated Trump’s messages and concerns regarding Khashoggi’s disappearance to President Erdogan. *) Pompeo flew in from Saudi Arabia, where he held talks with King Salman his son Crown Prince Mohammed and Foreign Minister Adel al Jubeir. "In each of those meetings I stressed the importance of them conducting a complete investigation into the disappearance of Jamal Khashoggi. They made a commitment to do that. *) Turkish officials said on Tuesday that the search of Saudi consul's Istanbul home is not over and will continue once the disagreements between the two sides are resolved. Sources say, investigators did not have the same access to the home as they did to the Saudi consulate building. US Secretary of State Mike Pompeo said that Saudi leaders strongly denied any knowledge of what took place in their Istanbul consulate during a visit by the US-based Saudi journalist Jamal Khashoggi and promised a serious and credible investigation. He said, "My assessment from these meetings is that there is serious commitment to determine all the facts and ensure accountability, including accountability for Saudi Arabia’s senior leaders or senior officials." *) Trump Tuesday criticised rapidly mounting global condemnation of Saudi Arabia over the case of the missing journalist, warning of a rush to judgment. Earlier, Trump said Saudi Arabia's Crown Prince Mohammed denied knowing what happened in the Saudi consulate in Istanbul where Khashoggi vanished two weeks ago. *) Foreign ministers from the G-7 group of industrialised nations say they are very troubled by Khashoggi's disappearance and say those responsible must be held to account. The statement from Canada, France, Germany, Italy, Japan, United Kingdom and United States as well as the European Union affirms their commitment to defending freedom of expression and protection of a free press and encourages Turkish-Saudi collaboration. *) Republican Senator Lindsey Graham took a dig at the Saudi crown prince, calling him a “wrecking ball” and “toxic” figure. In an interview to Fox News, the South Carolina Republican said it was up to Trump to decide the US’s course of action, but he said, “I know what I’m going to do: We’ll sanction the hell out of Saudi Arabia,” according to Wall Street Journal. “Nothing happens in Saudi Arabia without MBS knowing about it,” Graham said, using the acronym for prince Mohammed bin Salman. *) Turkish officials had earlier confirmed to CNN that Khashoggi’s body was dismembered after he was killed at Saudi Arabia’s Istanbul consulate two weeks ago. The Washington Post was also provided with scans of passports that Turkish officials say were carried by seven men who were part of a Saudi team involved in the killing. Saudi Crown Prince Mohammad bin Salman unwaveringly denies knowledge of what happened to Khashoggi, Trump said on Tuesday. "Just spoke with the Crown Prince of Saudi Arabia who totally denied any knowledge of what took place in their Turkish Consulate," Trump said on Twitter. "He was with Secretary of State Mike Pompeo during the call, and told me that he has already started, and will rapidly expand, a full and complete investigation into this matter. Answers will be forthcoming shortly," he added. *) Police teams arrived at the Saudi consul general's residence in Istanbul and started searching in relation to the disappearance of Khashoggi. *) Saudi Arabia's consul to Istanbul on Tuesday left the Turkish city bound for Riyadh on a scheduled flight, reports said, as Turkey prepared to search his residence in the probe. Consul general Mohammed al Otaibi took off for Riyadh on a 1400 GMT flight from Istanbul, the Haber-Turk newspaper reported on its website. The state-run Anadolu news agency also reported he had left Turkey. The website of Ataturk International Airport showed a flight of flag-carrier Saudia took off for Riyadh at 1400 GMT. Security forces began setting up barricades in front of the residence just hours after Otaibi flew out. Saudi Arabia did not immediately acknowledge the consul left the country. *) A high-level Turkish official speaking to The Associated Press on condition of anonymity because he was not authorised to speak publicly about the investigation said police have found "certain evidence" during their search of the Saudi Consulate showing that Khashoggi was killed there. The official did not provide details on the evidence that was recovered during the hours-long search at the diplomatic mission that ended early on Tuesday. This information comes after Prince Mohammed told US top diplomat Mike Pompeo that they are "strong and old allies", during talks earlier in the day. Both men were seen smiling and exchanging pleasantries ahead of a closed-door meeting to discuss the case. "We are strong and old allies. We face our challenges together - the past, the day of, tomorrow," Prince Mohammed told Pompeo. Earlier, Pompeo expressed concern about the disappearance of Khashoggi during a meeting with Saudi foreign minister and thanked King Salman for his commitment to investigating it, the State Department said. *) Turkish Foreign Minister Mevlut Cavusoglu said no confession from Saudi side has been made yet regarding the missing journalist. Cavusoglu said his US counterpart Pompeo will bring information from Saudi Arabia to Turkey regarding Khashoggi when he arrives in Ankara on Wednesday. Meanwhile, Turkey has given the prosecutor permission to ask for the testimony of people at the Saudi consulate who it deems is related to the investigation into the disappearance. *) Turkish President Recep Tayyip Erdogan said he hopes a reasonable opinion will be reached as soon as possible in the investigation, saying the search in the Saudi consulate in Istanbul will continue with the investigation also looking into toxic materials. Erdogan said there is a possibility that parts of the Saudi consulate had been repainted. Turkish police will also be searching the residence of the Saudi consul in Istanbul as part of their investigation, a diplomatic source said Tuesday. The time of the search was not made public. *) UN High Commissioner for Human Rights Michelle Bachelet has called on Saudi Arabia and Turkey to reveal all they know about the disappearance and possible murder Khashoggi. She said, "Immunity should not be used to impede investigations into what happened and who is responsible." Her spokesperson during a UN Human Rights Council briefing said, "Considering the seriousness of situation, the UN High Commissioner for Human Rights, Michelle Bachelet, believes the inviolability and immunity of relevant premises and officials ensured by the 1963 treaty of Vienna Convention should be waved immediately. Immunity should not be used to impede the investigation into what happened. Two weeks is too much time for not allowing a forensic investigation. The Kingdom of Saudi Arabia and Turkey are both signatories to the Vienna Convention." Turkish investigators who searched the Saudi consulate in Istanbul took evidence including soil samples, a senior Turkish official said on Tuesday. "The Turkish crime scene investigators carried out searches in the consulate and took the things deemed necessary," the official told Reuters. Early on Tuesday morning, a Saudi team investigating the Khashoggi disappearance left the Saudi consulate building in Istanbul. A few hours earlier, a team of around 10 Turkish police investigators and a prosecutor left after a nine-hour search. The Wall Street Journal, also cited people familiar with the matter, who said the kingdom is weighing whether to say that rogue operatives killed Khashoggi by mistake during an interrogation. The Journal, like CNN, said the Saudi statement has not been finalised. Trump said he had seen a media report that Saudi officials might say Khashoggi was killed during an unauthorised interrogation, but "nobody knows" if this was an official report. Calling Khashoggi's disappearance a "terrible situation," he further said that the US is working with Saudi Arabia and Turkey to figure out what happened. Meanwhile, Alphabet Inc's Google became the latest company to drop out of a business conference in Saudi Arabia. Earlier, a joint Saudi-Turkish team entered the Saudi Consulate in Istanbul to search it, nearly two weeks after the disappearance of Saudi journalist and Riyadh critic Jamal Khashoggi. The Turkish team arrived on Monday afternoon shortly after 1500 GMT to the consulate in Istanbul's upscale 4th Levent neighbourhood as journalists filmed and shot photographs of their arrival. A Saudi team had arrived at the building some half an hour beforehand and were greeted by Turkish prosecutor Hasan Yilmaz who was already waiting at the entrance. It's unclear what kind of search the officials will conduct and if it will involve forensics, especially since Khashoggi disappeared some two weeks ago. Meanwhile, Trump suggested on Monday that “rogue killers” could be responsible for the Saudi journalist’s disappearance after a personal phone call in which Trump said Saudi Arabia’s King Salman strongly denied any knowledge of what happened to Jamal Khashoggi. Trump also announced he’d dispatched Secretary of State Mike Pompeo to the Kingdom and anywhere else necessary to get to the bottom of the suspected murder of Khashoggi. Pompeo is expected to stop in Turkey after his trip to Saudi Arabia to talk with King Salman about the missing journalist, a National Security Council spokesman said on Monday. Saudi King Salman bin Abdulaziz on the weekend ordered the Saudi public prosecutor to open an internal investigation into the Khashoggi case, partly due to information received from Turkish authorities, a Saudi official said on Monday, speaking on condition of anonymity. Meanwhile, Reuters is reporting that BlackRock CEO Larry Fink will not attend a high-profile Saudi Arabia investor conference amid concerns over Khashoggi's fate. BlackRock is currently the world's largest asset manager with $6.29 trillion in assets under management as of December 2017. Blackstone Group CEO Stephen Schwarzman is also not attending the Future Investment Initiative conference, dubbed 'Davos in the desert', according to Reuters. Blackstone is the world's biggest manager of alternative investments. Turkish President Recep Tayyip Erdogan in a phone call with Saudi King Salman stressed forming a joint working group to probe the disappearance of Khashoggi, a Turkish presidential source said. Earlier, Saudi Arabia had rejected threats to punish it over the journalist's disappearance, saying the kingdom would retaliate against any sanctions with tougher measures. The comments came after Trump threatened "severe punishment" for Riyadh if it turned out the Riyadh critic was killed in the Saudi consulate in Istanbul. Meanwhile, the British, French, and German governments directly appealed to Saudi Arabia “to provide a complete and detailed response” to Khashoggi's disappearance. The list of top business executives and international companies pulling out of a high-profile economic conference Riyadh will host later this month continues to grow. The latest high-profile name to withdraw was JP Morgan Chase & Co Chief Executive Jamie Dimon, although the company did not elaborate on the reasons for Dimon's decision not to attend the Future Investment Initiative conference. Ford Motor Co Chairman Bill Ford has also canceled plans to attend the event. Meanwhile, former CIA Director John Brennan told NBC Saudi Arabia's denials of involvement in the alleged murder of Khashoggi "ring hollow." “If Khashoggi had disappeared in Turkey when he was at a hotel or a private residence, I think there is plausible deniability on the part of the Saudi government. But he disappeared when there is video evidence of him being at the consulate," Brennan said. "Their denials ring hollow, very much ring hollow. To go after a permanent resident of the United States who writes for The Washington Post, and doing it on foreign soil, at a diplomatic mission, to me it would be inconceivable. That such an operation would be run by the Saudis without the knowledge of the day-to-day decision maker of Saudi Arabia, that's Crown Prince Mohammed bin Salman. I think it is just beyond reality." Turkey expects cooperation from Saudi Arabia in the Khashoggi cause, Foreign Minister Mevlut Cavasoglu said in London. He said there is consensus on forming a joint working group with Saudi Arabia. Saudi Arabia's interior minister rejected claims there were orders to kill the missing Riyadh critic and journalist, describing them as "baseless allegations and lies". Prince Abdel Aziz bin Saud bin Nayef said his country was "in compliance with international laws and conventions," the official Saudi Press Agency reported him saying. TRT World sources denied Turkish newspaper Sabah 's report that Khashoggi may have used his Apple Watch to record his own torture and murder at Saudi Arabia's consulate in Istanbul. Sabah reported that the audio of his "interrogation, torture and possible killing was recorded and automatically sent to both his iPhone and cloud account." The Saudi team investigating Khashoggi's disappearance was to meet prosecutors in Istanbul on Saturday. The team reached Ankara on Friday. Trump said in a CBS interview aired on Saturday that there would be "severe punishment" for Saudi Arabia if it turns out that Khashoggi was killed in the Saudi consulate in Istanbul. Trump declared the US will uncover the truth about what happened to Khashoggi. Trump told reporters that he has not talked to Saudi Arabia's King Salman but will call the royal leader soon. In a statement posted on Twitter, the Saudi Foreign Ministry expressed its appreciation to Turkey for agreeing to form a "joint action team," adding that the kingdom is keen "to sustain the security and safety of its citizenry, wherever they might happen to be." The Saudi authorities have an “obligation” to divulge the fate of missing Saudi journalist Khashoggi, according to UK-based rights watchdog Amnesty International. French President Emmanuel Macron says his country wants to know "the whole truth" about Khashoggi's disappearance and he will discuss the issue with Saudi authorities and the Turkish president in the coming days. Major US defence contractors expressed concern to the Trump administration that lawmakers angered by the disappearance of Jamal Khashoggi will block further arms deals with Saudi Arabia, a senior US official said. Meanwhile, an exiled member of the Saudi royal family, Khaled bin Farhan al Saud, told The Independent that Saudi authorities had a similar plot to kidnap him from the Saudi consulate in Cairo, 10 days before Jamal Khashoggi went missing. The 41-year-old exiled prince, who lives in Germany, further said that five other grandsons of late King Abdul Aziz, founder of the modern Saudi kingdom, had tried to express their dissent against Khashoggi's disappearance. He added that the princes were detained by Saudi authorities and their whereabouts are not known since then. The Washington Post reported that the Turkish government has told US officials it has audio and video recordings which show how Khashoggi was "interrogated, tortured and then murdered" inside the consulate before his body was dismembered. US Department of State officials weren't immediately available for comment. Separately, Turkish Presidential spokesman Ibrahim Kalin said Turkey accepted a Saudi proposal to form a joint-working group to investigate Khashoggi's disappearance. Turkey’s Foreign Minister Mevlut Cavusoglu said Turkey would release information about what happened with Khashoggi after an investigation. Earlier, the Washington Post reported that US intelligence intercepts outlined a Saudi plan to detain Khashoggi. The Post, citing anonymous US officials familiar with the intelligence, said Prince Mohammed ordered an operation to lure Khashoggi from his home in Virginia to Saudi Arabia and then detain him. Senate Foreign Relations Committee chairman Bob Corker says he has reviewed US intelligence reports suggesting that Khashoggi was killed on October 2, the day he went to the consulate. Corker and Top Democrat Bob Menendez are triggering an investigation into his disappearance. Turkish authorities have said he was killed by an elite Saudi "hit squad." The Saudi government has dismissed that allegation. Erdogan said on Thursday, "If a bird flew, if a mosquito appeared, these systems would catch them, and [I believe] they [the Saudis] would have the most advanced of systems." Saudi royal guards, intelligence officers, soldiers and an autopsy expert were part of a 15-member team from the kingdom that targeted missing writer, local Turkish media reported. Security sources earlier told TRT World one of the men was Salah Muhammed al Tubaigy who heads a “Forensic Evidence Unit” in Saudi Arabia’s “General Security Directorate." Meanwhile, Trump appeared reluctant to consider blocking arms sales to the Kingdom over the disappearance, citing economic reasons. He has said he spoke with the Saudis about what he called a "bad situation," and also said the US was working "very closely" with Turkey. Photos of the 15 men thought to be the Saudi ‘hit squad’ checking in to hotels in Istanbul circulated and were identified by Turkish media who cited officials. TRT World also obtained footage showing Khashoggi entering the Saudi consulate on October 2. A screenshot of Khashoggi entering the consulate taken by a Turkish police camera, at 1:14pm on October 2 is the last known image seen of the writer who was living in exile between Washington, DC and Istanbul. Turkish security sources told TRT World that the ‘hit squad’ took CCTV footage from the consulate with them when they left Turkey. Saudi officials offered to allow Turkey to search the premises of the consulate in Istanbul. Meanwhile, UN human rights expert David Kaye called for an independent international investigation into the disappearance, urging that the probe "should not be politicised." He said the case has created a dilemma for the Turkish government. It "puts basically the Turks in the position of having both to maintain a diplomatic relationship and to deal with a real important, high-profile investigation." Turkish officials said they suspect the Washington Post contributor was killed at the Saudi Consulate and that his body was later removed from the building. The Saudi consulate says Khashoggi left its premises. Erdogan said the kingdom has the responsibility to prove its claim that the missing Saudi journalist left the consulate alive. The Saudi ambassador to Turkey was summoned to the ministry to request Riyadh's cooperation in the investigation, a Turkish official said. Turkey also requested permission to search the consulate building. Turan Kislakci, Khashoggi’s friend, said on October 7 that officials told him to "make your funeral preparations" as the Washington Post contributor "was killed" at the Saudi Consulate. "What was explained to us is this: He was killed, make your funeral preparations," Kislakci said. "We called a few other places, but they said, 'We have evidence he was killed in a barbaric way, we will announce it tomorrow or the day after.'" A Turkish official said on October 6 that an "initial assessment" by police concluded Khashoggi had been killed at the consulate. The Washington Post printed a blank column in its newspaper on October 5, in solidarity with Khashoggi titled "A missing voice" and called on Prince Mohammed to ensure he "is free and able to continue his work." Supporters held rallies outside the consulate during the week. Press freedom groups called on Salman to ensure Khashoggi's safety.